Many people as about facebook marketing ideas. The reason is, some people have attempted to market on Facebook and didn’t really have success. So, they declare marketing on this social platform does not work and never try it again. But, it all depends on what your goals are for marketing online. If you have a small local business having a Facebook business page is a must these days. And, it can help brand your company. So, a small business owner could start small with a business page and work from there to get more customers. Facebook is not a quick marketing solution by any means. You really do have to know how to work it in order to find customers or create sales. As we said, having a presence on Facebook for a local business is a great way to brand your company. But, it does take some work and time to take off. 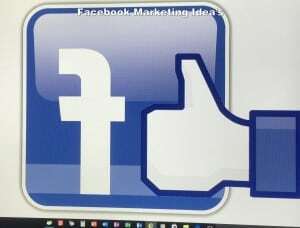 First you will have to create your page and then get some fans and likes to you page. You can get likes a couple of ways. First, you can like other local pages but use caution. Just like a few pages each day until you build a following. You don’t want to seem like a spammer. Next, you will need to target your local area and use Facebook like ads. This will help you establish an audience on your page. For this to work good, you will need a good amount of likes. Facebook has what they call edge rank in place and this will stop your posts from showing to many people even when you do have many people liking your page. Once you have 500 – 1000 or more likes then you will start posting to your timeline. Make sure to post helpful content for your readers or they will start to ignore your posts. Then, every so often, you could post offers, coupons and discounts. Facebook marketing is what’s known as interruption marketing. People are not actively looking for what you are offering. So you have to do things that grab their attention. Another way facebook can be used is by affiliate marketers. Again, you would create a page for whatever product or website you are promoting and then build a fan base. Some people choose to send people straight to affiliate offers and this still may work for some people but we know Facebook frowns upon this method. The best way is to, build your fan page, get as many likes as your budget allows, and then build a relationship with your fans. Just always be mindful of Facebook TOS and ad guidelines. Facebook will shutdown accounts they deem, breaking their guidelines. So, the best thing we think is to send people over to your email list. Your email list is an asset and you will be able to market to your list over and over. If you are just sending people to affiliate offers then it’s really hit and run marketing. You will need something to create landing pages and a lead magnet so people will feel compelled to give your their email address. In today’s day and age people do not part with their email like they used to. So, make your offer good. Don’t buy likes for your pages as you want and need real targeted fans who will actually interact with your page. It does take a while and work to become successful with Facebook marketing. So, don’t give up. Here are some useful tips you can use when marketing a business or even as an affiliate on Facebook. These are just some things you can do to make your ads, fans pages and everything else more successful. When using facebook ads, weather it’s for likes, sending people to a website or anything else. You want to use emotion. Emotion is what sells best. For instance, say you are marketing a baseball product well, instead of just having one ad showing the actual product, try out another one. In your 2nd ad try adding another picture that shows more emotion about baseball. You could try a picture of Babe Ruth or another famous baseball hero. Or maybe even the winning champion word series team celebrating. You will have to try out a few ads always trying to beating your control ad. As with anything you do in business marketing, you will want to test everything. The ad you had that outperformed last weeks ad can always be beaten by another great ad. If you don’t test ads you are not really marketing. When you are testing, you want come upon that one ad that outperforms all others and makes your company a ton of money. Again, we have seen plenty of people who started a Facebook page and expected people and traffic to start rolling right away. It does not work this way. It takes dedication, time and in many cases some money to get things moving. If you don’t have the time for Facebook, the consider hiring someone to do it for you. Being on Facebook these days is a lot like the need to have a website. Many people may hear about your company and search for it online. They are curious and just want to see what your business is all about. And, if you are not there on Facebook, they will forget all about you and maybe even never return.